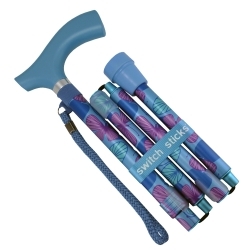 Kiki - Folding Walking Stick Height Adjustable. Colours: Shaft - Blue with light blue, purple and black butterfly motif. Light blue handle, rubber base and wrist strap.